This has some terrific ideas for outdoor parties. Think of having a luau and how much fun it would be. Besides drink recipes, the book has nibbles. How does Crab Rangoon, Cha Siu Pork or Crispy Prawns sound? With this book, you are ready for Polynesian-style entertaining. By Bill Marsano. Trader Vic’s Tiki Party! 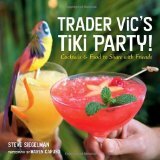 : Cocktails & Food to Share with Friends,” by Stephen Siegelman, is perfect for retro theme parties. Trader Vic, with his famous rival Don the Beachcomber, ushered in the Tiki Bar Era of American partying, which centered mainly on the 1950s and 1960s (which of these two men actually invented the Mai Tai, signature drink of the epoch, remains in dispute–both claim it.) Those were days of restaurants blanketed with faux-Polynesian decor, when pupu platters were the rage and drinks came in bowls serving four or more and were decorated with paper umbrellas, which folks later learned to call parasols. Relive that glorious and joyously ridiculous time with this collection of tropical cocktails and food recipes for everything from finger food to entrees. The recipes are interesting, mostly pretty easy to make, and generally fun to eat or drink. The photos are very nice but the main appeal is that the recipes are clearly presented and easy to follow.–Bill Marsano is an award-winning writer on wines and spirits.